Are you looking for a great slow cooker pork chops recipe that does not require a lot of prep work? 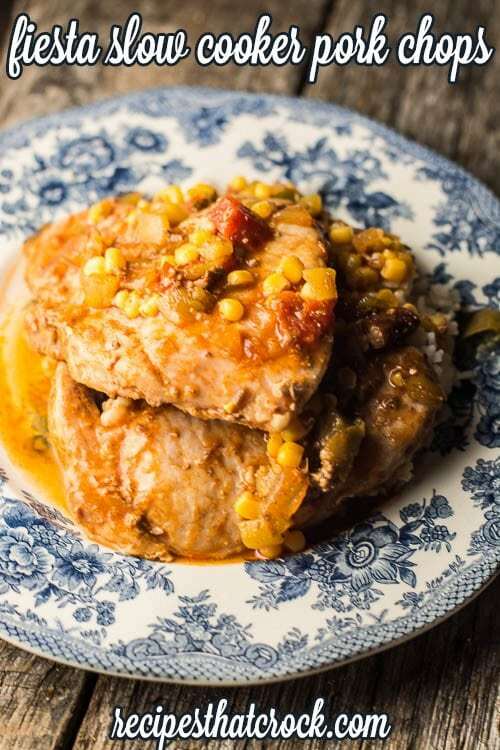 This Fiesta Slow Cooker Pork Chops recipe truly is a quick and easy recipe that is packed full of flavor and ready to cook in less than 5 minutes. The flavor from today’s recipe will take your mind south of the border…or at least to your favorite Mexican restaurant! The chilies, chili beans and salsa combine for a wonderful burst of flavor and the corn provides the perfect amount of sweetness to make this dish an instant family favorite for your next fiesta! Now I didn’t come up with this genius idea all on my own. I dove into one of Cris’ Gooseberry Patch cookbooks, “Everyday Slow Cooker*” for a GOODe recipe to try and found this recipe from Linda Wolfe from Westminster, Colorado. *Note: That link to the awesome cookbook we mentioned has a crazy expensive price because the book is currently out of print BUT we got great news from our friends at Gooseberry Patch that it is back at the presses so look for a much more reasonable price in the very near future. Linda sure is on to something here. This is literally THE EASIEST recipe I have ever made. It took me less than 5 minutes to put it together and that includes turning the crock pot on. The pork chops came out so tender and full of flavor. Serve these bad boys up over a bed of rice and dinner is complete! 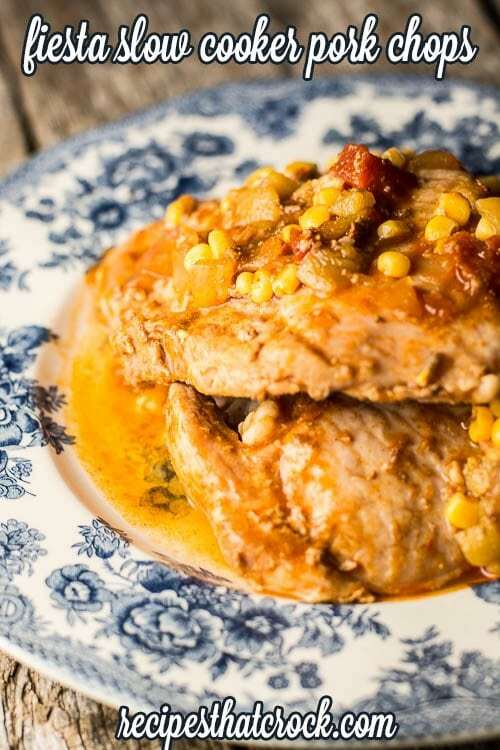 Fiesta Slow Cooker Pork Chops Recipe: One of our favorite quick and easy crock pot recipes. Ready to cook in 5 minutes . 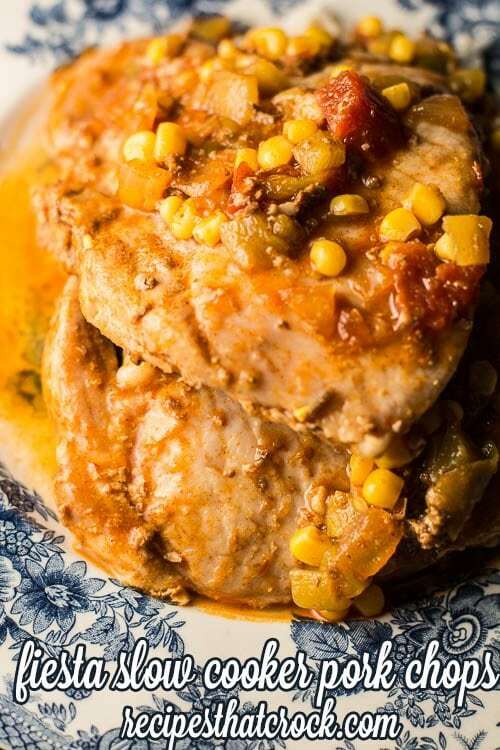 Flavorful and tender chops with a fiesta twist! Layer all ingredients except rice in order into slow cooker. How would this recipe do as a freezer meal? Dump all the ingredients in freezer bag, freeze then thaw and cook when ready? My slow cooker has two low setting, 8 or 10 hours and I work all day so what would you suggest? This recipe sounds delicious but I’m afraid it would get way overcooked. If you have the chance, I would try cooking it on low for 8 hours on a weekend where you can watch it closely to make sure it doesn’t overcook. If it does okay, then you will know with confidence how it will do while you are away on a work day. If that doesn’t work for you, you might try the following: if your crockpot is 5 to 6 qts, you might be able to fit an oven-safe dish inside your pot and put the ingredients in the dish. Then pour a little water around the outside of the dish (so the water hits the outside of the dish about halfway up. The dish will be a smaller cooking vessel and should make the dish take longer to cook. Good luck! Would love to hear how it works out for you. Enjoy! I really enjoy all of the recipes that you share with me. Thanks so very much. Aw thanks Deborah!! Thanks for dropping by! These really did turn out fantastic babe! Yum!